When it comes to buying me gifts, one of the safest routes to go is always skincare. I can take it or leave it when it comes to makeup, but skincare is my thing and I will never ever have enough. I love to try out new brands, and different types of skincare, but when I opened my latest skincare gift set I have to admit I was a teeny bit insulted. At the ripe old age of 27, I got my first official set of 'anti ageing' products. Thanks mum. Turns out the lovely lady at the Estée Lauder counter recommended the 'Revitalizing Supreme +' for me. Apparently I've reached the age of The Slow Decline. And I need to help my skin now for later! Since I, like lots of girls my age, have a little bit of dread for the day when I wake up with a wrinkle that doesn't turn out to be a big old pillow crease (classy), once I'd calmed down a little bit I was actually quite excited to try the set. 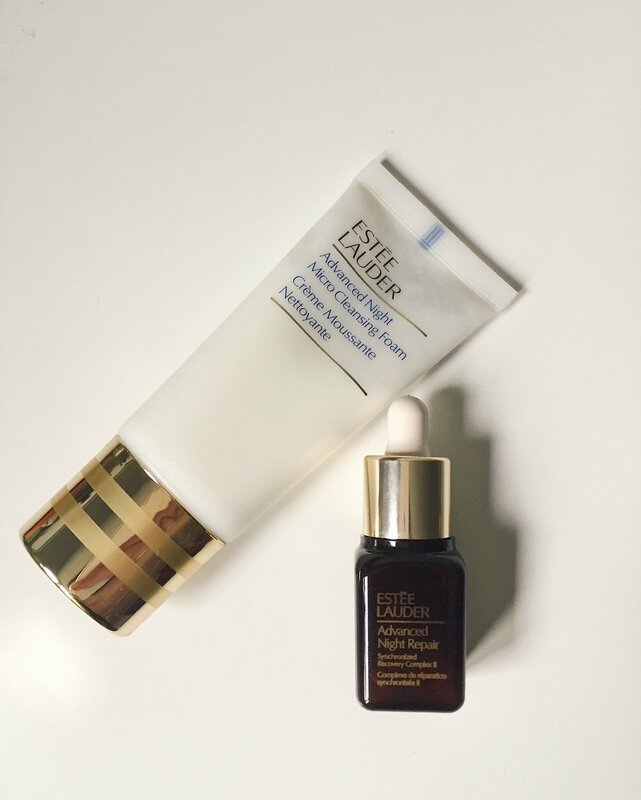 My evening routine has now consisted purely of Estée Lauder products for a few months, and I have to say I've really noticed a difference. When I've been getting ready for bed, my first step is to cleanse my face with the 'Advanced Night Micro Cleansing Balm'. I have to say, I haven't noticed too much of a difference from a normal face wash other than it's a slightly creamier consistency - and it smells lovely. Though I probably wouldn't be repurchasing. Once my face feels nice and fresh, I've been using the 'Advanced Night Repair Serum', which I have to say is one of the lightest serums I've ever used. How have I never tried this before?? It leaves no film on the skin, and sinks in practically straight away. My skin looks brighter and fresher - I was rocking a Moritcia/fresh from the coffin look before. Once the serum has settled (which literally takes all of 10 seconds!!) I use the 'Global Anti-Aging Cell Power Creme'. The name sounds scary, as does the product description. But the cream itself is an absolute dream to use. It goes on thick, and doesn't sink in for what seems like forever. It's like throwing on a big load of hydrating goop and then going to sleep and waking up with juicy, plump and smooth skin. I don't even care at this point that the range is aimed at older ladies with lines to combat, I just like feeling like I've given myself a facial every night. The last product I use in my short little evening routine is the 'Cell Power Eye Balm', which again I'm now obsessed with. The one place I have started noticing some fine lines is around my eyes. Safe to say the Eye Balm has been the first product I finished because I was shovelling that stuff on like it was going out of fashion. Like the Creme, it goes on quite thick, and takes a good while to sink in. But at night time that's what I love. Going to sleep feeling like I have on skincare that is actually doing something is amazing. And I've noticed a serious difference. The little lines I've noticed have all but disappeared in the two moths I've been using the range, and the dark (ok black) circles under my eyes are now a much much paler shade of grey. Yay! Now that I'm into my 28th year (not till August though), I've decided to embrace the lovely anti-aging products there are out there. I'm just going to think of them more as 'age-prevention'! And the Estée Lauder Revitalizing Supreme collection has officially topped the list of my new favourites.